Okay so i'm half a month late in bringing in the new year on my blog. It's been awhile since I've written. I took a small break from my knitting/crocheting because I worked like crazy for a month to prepare for some craft fairs I did in December. So I basically just got sick of working on things so quickly in so little time. I'm finally back into the swing of things and have made a couple new projects. 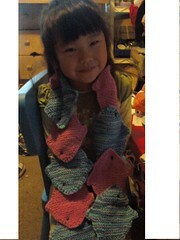 This project is inspired from Morehouse Farms fish scarf pattern. Alysia did not like the colors they offered in the kit and the pattern isn't available for purchase yet. I wasn't going to be spending $30 for a yarn color she didn't like. SOOO what did I do?? 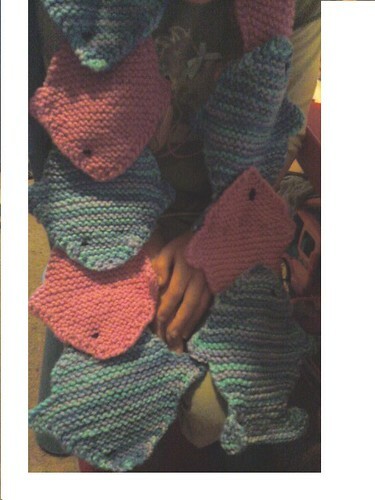 I designed my own fish to put together to make a scarf. I finished last night and gave it to her this morning. She loved it!! 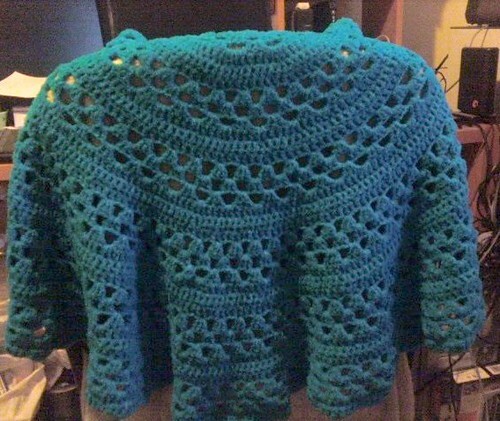 Another project I just finished was a shawl for Ariana. The past month has been pretty chilly over here. I started wearing my shawl at night and it kept me nice and toasty. I offered to make one for Ariana and this is what she picked! This year I am going to work really working through my stash of yarn that I have. Here's to hoping for a great crafting year!